At "The Kitchen" everything is proudly handmade by our award-winning chef/co-owner in small batches with fresh ingredients. Our unique and ever changing menu will be inspired by the seasonal availability of these ingredients and will feature exciting options to suit all tastes. Our staff are always willing to help and truly try to make your experience at The Kitchen one to remember. The Kitchen team has worked extremely hard to gain the trust and create a good reputation within the community. "The Kitchen" in Paris, Ontario is a unique catering company with a strong focus on fresh handmade food. Award-winning head Chef Brett Pottruff loves to create simple and flavourful meals for everyone to enjoy. We offer a simple and delicious menu with premium ingredients, with options for every taste. We also offer banquet catering for up to 100 people in our main dinning hall. The Kitchen also provides office and corporate catering, perfect for clients and guests that you're looking to impress!! If there is something else that you're looking for, send us a message and we will do our best to help!! Check out our catering menu below! Catering to Brantord and Brant County. "The Kitchen" is a small locally owned business within Brant County. We take pride in the work we do, and we are proud of the food and service we provide. We are very big on supporting the community around us, and are thrilled we can make a difference in people lives on a daily basis. We currently have 8 other local products that we use and sell, and our food and overall experience at "The Kitchen" wouldn't be what it is without them. Alche Design completes our beautiful caterings with their amazing handcrafted charcuterie boards and platters. Their skills go far beyond these boards and truly are masters of their craft. check them out! Bishop Family Bees sweetens your teas and coffees and adds a sweet flavour to chef Brett's cooking! Tripled filtered and tasty, these bees are buzzing around the local area and we couldn't bee happier! Check them out! Moon Artist Jewelry is beautifuly handmade by a local crafter here in Brantford. Her pieces are unique, full of energy, and made with some serious love. You can check her pieces here in "The Kitchen" or check her out on her etsy page! Pristine Gourmet is a fourth generation farming family that grows and cold-presses their own oils and infused vinegar! Fantastic! This product is of high quality and truly adds to the flavours of chef Brett's cooking. Beautiful colour and exceptional taste! Growing their product just outside of Waterford and it's only a short drive to their family farm from the Brantford Area, Check them out! Sacred Bean Cacao is a handmade cacao drink, rich in antioxidants, high in fiber and protein. Wonderful dark chocolate taste! Terra Teas Organic produces and distributes their hand blended teas to range of cafes and restaurants in SW Ontario, and it is obvious why! Their teas are fresh, well balanced, aromatic and full of flavor. You can come into The Kitchen for a cup or you can take home a 50g bag for only $12! Check them out! The Jelly Girls make some amazing jams and jellies. Our charcuterie boards wouldn't be the same, our desserts wouldn't be the same, our fresh baked biscuits just wouldn't same without those fresh and delicious jellies! Made right here in Brantford!! Check them out! Five Oaks Retreat Centre is located just outside of Brantford, minutes from the 403 Highway and nestled in the Grand River Valley. The Kitchen operates as their oficial on-site caterer and can offer an assortment of options for any occasion. There are both large outdoor and indoor venue spaces that offers potential for any event. Overnight accommodation, meeting space and tranquil environment make Five Oaks a great place for any retreat. Hiking trails, access to the Grand River and prime fishing possibilities along whiteman's creek also make this place an adventurers dream! 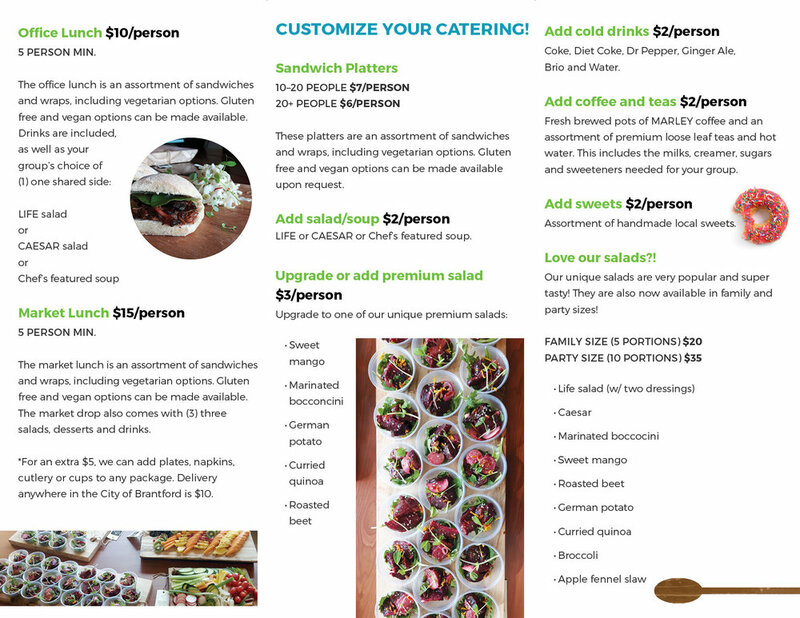 Check Out Our Catering Brochure! © 2016 The Kitchen. All rights reserved.